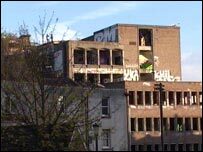 A 24-year-old man, believed to be a graffiti artist, remains in a serious condition after falling from a derelict building in Bristol. He is thought to have fallen from up to four floors and suffered a broken back, serious leg wounds, head and internal injuries on 1 May. Police were called to Westmoreland House near Stokes Croft and Ashley Road after reports of an assault. But inquiries revealed he may have been spraying graffiti on the building. An Avon and Somerset Police spokeswoman warned people of the "extreme danger" of entering derelict buildings. "Anyone doing so is risking their own life and that of others. "The man is expected to remain in hospital for some time," she added. Earlier this week, a gang spent two days daubing a 30ft mural, depicting a deformed child's head and lizard, across a wall at the same site. Despite calls from the public, Avon and Somerset Police ruled it was too dangerous to send their officers in to arrest the gang and did not have the manpower to wait for them.